The very early universe – the first picosecond (10−12) of cosmic time. It includes the Planck epoch, during which currently understood laws of physics may not apply; the emergence in stages of the four known fundamental interactions or forces – first gravity, and later the strong, weak and electromagnetic interactions; and the expansion of space and supercooling of the still immensely hot universe due to cosmic inflation, which is believed to have been triggered by the separation of the strong and electroweak interaction. Tiny ripples in the universe at this stage are believed to be the basis of large-scale structures that formed much later. Different stages of the very early universe are understood to different extents. The earlier parts are beyond the grasp of practical experiments in particle physics but can be explored through other means. The early universe, lasting around 377,000 years. Initially, various kinds of subatomic particles are formed in stages. These particles include almost equal amounts of matter and antimatter, so most of it quickly annihilates, leaving a small excess of matter in the universe. At about one second, neutrinos decouple; these neutrinos form the cosmic neutrino background. If primordial black holes exist, they are also formed at about one second of cosmic time. Composite subatomic particles emerge – including protons and neutrons – and from about 3 minutes, conditions are suitable for nucleosynthesis: around 25% of the protons and all the neutrons fuse into heavier elements, mainly helium-4. At about 377,000 years, the universe finally becomes cool enough for neutral atoms to form ("recombination"), and as a result it also became transparent for the first time. The newly formed atoms – mainly hydrogen and helium with traces of lithium – quickly reach their lowest energy state (ground state) by releasing photons ("photon decoupling"), and these photons can still be detected today as the cosmic microwave background (CMB). This is currently the oldest observation we have of the universe. Dark Ages and large-scale structure emergence, from 377,000 years until about 1 billion years. After recombination and decoupling, the universe was transparent but the clouds of hydrogen only collapsed very slowly to form stars and galaxies, so there were no new sources of light. The only photons (electromagnetic radiation, or "light") in the universe were those released during decoupling (visible today as the cosmic microwave background) and 21 cm radio emissions occasionally emitted by hydrogen atoms. The decoupled photons would have filled the universe with a brilliant pale orange glow at first, gradually redshifting to non-visible wavelengths after about 3 million years, leaving it without visible light. This period is known as the Dark Ages. Between about 10 and 17 million years the universe's average temperature was suitable for liquid water (273 – 373K) and there has been speculation whether rocky planets or indeed life could have arisen briefly, since statistically a tiny part of the universe could have had different conditions from the rest, and gained warmth from the universe as a whole. At some point around 400 to 700 million years, the earliest generations of stars and galaxies form, and early large structures gradually emerge, drawn to the foam-like dark matter filaments which have already begun to draw together throughout the universe. The earliest generations of stars have not yet been observed astronomically. They may have been huge and non-metallic with very short lifetimes compared to most stars we see today, so they commonly finish burning their hydrogen fuel and explode as supernovae after mere millions of years. Other theories suggest that they may have included small stars, some perhaps still burning today. In either case, these early generations of supernovae created most of the everyday elements we see around us today, and seeded the universe with them. Galaxy clusters and superclusters emerge over time. At some point, high energy photons from the earliest stars, dwarf galaxies and perhaps quasars led to a period of reionization. The universe gradually transitioned into the universe we see around us today, and the Dark Ages only fully came to an end at about 1 billion years. The universe as it appears today. From 1 billion years, and for about 12.8 billions of years, the universe has looked much as it does today. It will continue to appear very similar for many billions of years into the future. The thin disk of our galaxy began to form at about 5 billion years (8.8 bn years ago), and the solar system formed at about 9.2 billion years (4.6 bn years ago), with the earliest traces of life on Earth emerging by about 10.3 billion years (3.5 bn years ago). From about 9.8 billion years of cosmic time, the slowing expansion of space gradually begins to accelerate under the influence of dark energy, which may be a scalar field throughout our universe. The present-day universe is understood quite well, but beyond about 100 billion years of cosmic time (about 86 billion years in the future), uncertainties in current knowledge mean that we are less sure which path our universe will take. The far future. At some time the Stelliferous Era will end as stars are no longer being born, and the expansion of the universe will mean that the observable universe becomes limited to local galaxies. There are various scenarios for the far future and ultimate fate of the universe. More exact knowledge of our current universe will allow these to be better understood. Note: The radiation temperature in the table below, refers to the cosmic background radiation and is given by 2.725·(1+z), where z is the redshift. (>1019 GeV) The Planck scale is the physical scale beyond which current physical theories may not apply, and cannot be used to calculate what happened. During the Planck epoch, cosmology and physics are assumed to have been dominated by the quantum effects of gravity. (>1016 GeV) The three forces of the Standard Model are unified (assuming that nature is described by a Grand unification theory). (1015 ~ 109 GeV) Cosmic inflation expands space by a factor of the order of 1026 over a time of the order of 10−33 to 10−32 seconds. The universe is supercooled from about 1027 down to 1022 kelvins. The Strong interaction becomes distinct from the Electroweak interaction. (>100 MeV) The forces of the Standard Model have separated, but energies are too high for quarks to coalesce into hadrons, instead forming a quark-gluon plasma. These are the highest energies directly observable in experiment in the Large Hadron Collider. (>1 MeV) Quarks are bound into hadrons. A slight matter-antimatter-asymmetry from the earlier phases (baryon asymmetry) results in an elimination of anti-hadrons. (1 MeV) Neutrinos cease interacting with baryonic matter. The sphere of space that will become the observable universe is approximately 10 light-years in radius at this time. (1 MeV ~ 100 keV) Leptons and anti-leptons remain in thermal equilibrium. (100 keV ~ 1 keV) Protons and neutrons are bound into primordial atomic nuclei, hydrogen and helium-4. Small amounts of deuterium, helium-3, and lithium-7 are also synthesized. At the end of this epoch, the spherical volume of space which will become the observable universe is about 300 light-years in radius, baryonic matter density is on the order of 4 grams per m3 (about 0.3% of sea level air density) – however, most energy at this time is in electromagnetic radiation. (100 keV ~ 0.4 eV) The universe consists of a plasma of nuclei, electrons and photons; temperatures remain too high for the binding of electrons to nuclei. (0.4 eV) Electrons and atomic nuclei first become bound to form neutral atoms. Photons are no longer in thermal equilibrium with matter and the Universe first becomes transparent. Recombination lasts for about 100 ka, during which Universe is becoming more and more transparent to photons. The photons of the cosmic microwave background radiation originate at this time. The spherical volume of space which will become the observable universe is 42 million light-years in radius at this time. The baryonic matter density at this time is about 500 million hydrogen and helium atoms per m3, approximately a billion times higher than today. This density corresponds to pressure on the order of 10−17 atm. Dark Ages 380 ka ~ 150 Ma 1100 ~ 20 4000 K ~ 60 K The time between recombination and the formation of the first stars. During this time, the only source of photons was hydrogen emitting radio waves at hydrogen line. Freely propagating CMB photons quickly (within about 3 million years) red-shifted to infrared, and Universe was devoid of visible light. Reionization 150 Ma ~ 1 Ga 20 ~ 6 60 K ~ 19 K The most distant astronomical objects observable with telescopes date to this period; as of 2016, the most remote galaxy observed is GN-z11, at a redshift of 11.09. The earliest "modern" Population III stars are formed in this period. and evolution 1 Ga ~ 10 Ga 6 ~ 0.4 19 K ~ 4 K Galaxies coalesce into "proto-clusters" from about 1 Ga (z = 6) and into Galaxy clusters beginning at 3 Gy (z = 2.1), and into superclusters from about 5 Gy (z = 1.2), see list of galaxy groups and clusters, list of superclusters. Present time 13.8 Ga 0 2.7 K Farthest observable photons at this moment are CMB photons. They arrive from a sphere with the radius of 46 billion light-years. The spherical volume inside it is commonly referred to as Observable universe. era 47 ka ~ 9.8 Ga 3600 ~ 0.4 104 K ~ 4 K During this time, the energy density of matter dominates both radiation density and dark energy, resulting in a decelerated metric expansion of space. dominated era >9.8 Ga <0.4 <4 K Matter density falls below dark energy density (vacuum energy), and expansion of space begins to accelerate. This time happens to correspond roughly to the time of the formation of the Solar System and the evolutionary history of life. Stelliferous Era 150 Ma ~ 100 Ga 20 ~ −0.99 60 K ~ 0.03 K The time between the first formation of Population III stars until the cessation of star formation, leaving all stars in the form of degenerate remnants. Far future >100 Ga <−0.99 <0.1 K The Stelliferous Era will end as stars eventually die and fewer are born to replace them, leading to a darkening universe. Various theories suggest a number of subsequent possibilities. Assuming proton decay, matter may eventually evaporate into a Dark Era (heat death). Alternatively the universe may collapse in a Big Crunch. Alternative suggestions include a false vacuum catastrophe or a Big Rip as possible ends to the universe. The standard model of cosmology is based on a model of space-time called the Friedmann–Lemaître–Robertson–Walker ("FLRW") metric. A metric provides a measure of distance between objects, and the FLRW metric is the exact solution of Einstein's field equations if some key properties of space such as homogeneity and isotropy are assumed to be true. The FLRW metric very closely matches overwhelming other evidence, showing that the universe has expanded since the Big Bang. If we assume that the FLRW metric equations are valid all the way back to the beginning of our universe, then we can follow them back in time, to a point where the equations suggest all distances between objects in the universe were zero or infinitesimally small. (This does not necessarily mean the universe was physically small at the Big Bang, although that is indeed one of the possibilities.) Going forward, this provides a model of our universe which matches all current physical observations extremely closely. This initial period of the Universe's chronology is called the "Big Bang". The standard model of cosmology does not attempt to explain why the universe began to exist; it explains only how the universe physically developed once that moment happened. We interpret the singularity from the FLRW metric as meaning that current theories are inadequate to describe what actually happened at the start of the Big Bang itself. It is widely believed that a correct theory of quantum gravity may allow a more correct description of that event, but no such theory has yet been developed. After that moment, all distances throughout the universe began to increase from (perhaps) zero because the FLRW metric itself changed over time. For this reason we say that the Big Bang "happened everywhere". During the very earliest moments of cosmic time, the energies and conditions were so extreme that our current knowledge can only suggest possibilities, so our current knowledge may turn out to be incorrect. To give one example, eternal inflation theories propose that inflation lasts forever throughout most of the universe, making the notion of "N seconds since Big Bang" ill-defined. Therefore the earliest stages are an active area of research and based on ideas which are still speculative and subject to modification as scientific knowledge improves. Although a specific "inflationary epoch" is highlighted at around 10-32 seconds, observations and theories both suggest that distances between objects in space have been increasing at all times since the moment of the Big Bang, and is still increasing today (with the exception of gravitationally bound objects such as galaxies and most clusters, once the rate of expansion had greatly slowed). The inflationary period marks a specific period when a very rapid change in scale occurred, but does not mean that it stayed the same at other times. Initially, the universe was inconceivably hot and dense. It has cooled over time, which eventually allowed the forces, particles and structures we see around us to manifest as they do today. The Planck epoch is an era in traditional (non-inflationary) Big Bang cosmology immediately after the event which began our known universe. During this epoch, the temperature and average energies within the universe were so high that everyday subatomic particles could not form, and even the four fundamental forces that shape our universe—electromagnetism, gravitation, weak nuclear interaction, and strong nuclear interaction—were combined and formed one fundamental force. Little is understood about physics at this temperature; different hypotheses propose different scenarios. Traditional big bang cosmology predicts a gravitational singularity before this time, but this theory relies on the theory of general relativity, which is thought to break down for this epoch due to quantum effects. 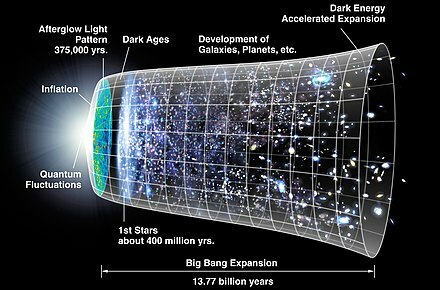 In inflationary models of cosmology, times before the end of inflation (roughly 10−32 second after the Big Bang) do not follow the same timeline as in traditional big bang cosmology. Models that aim to describe the universe and physics during the Planck epoch are generally speculative and fall under the umbrella of "New Physics". Examples include the Hartle–Hawking initial state, string landscape, string gas cosmology, and the ekpyrotic universe. As the universe expanded and cooled, it crossed transition temperatures at which forces separated from each other. These phase transitions can be visualised as similar to condensation and freezing phase transitions of ordinary matter. At certain temperatures/energies, water molecules change their behaviour and structure, and they will behave completely differently. Like steam turning to water, the fields which define our universe's fundamental forces and particles also completely change their behaviors and structures when the temperature/energy falls below a certain point. This is not apparent in everyday life, because it only happens at far higher temperatures than we usually see in our present universe. These phase transitions are believed to be caused by a phenomenon of quantum fields called "symmetry breaking". In everyday terms, as the universe cools, it becomes possible for the quantum fields that create the forces and particles around us, to settle at lower energy levels and with higher levels of stability. In doing so, they completely shift how they interact. Forces and interactions arise due to these fields, so the universe can behave very differently above and below a phase transition. For example, in a later epoch, a side effect of one phase transition is that suddenly, many particles that had no mass at all acquire a mass (they begin to interact differently with the Higgs field), and a single force begins to manifest as two separate forces. The grand unification epoch began with a phase transitions of this kind, when gravitation separated from the universal combined gauge force. This caused two forces to now exist: gravity, and an electrostrong interaction. There is no hard evidence yet, that such a combined force existed, but many physicists believe it did. The physics of this electrostrong interaction would be described by a so-called grand unified theory (GUT). The grand unification epoch ended with a second phase transition, as the electrostrong interaction in turn separated, and began to manifest as two separate interactions, called the strong and electroweak interactions. Depending on how epochs are defined, and the model being followed, the electroweak epoch may be considered to start before or after the inflationary epoch. In some models it is described as including the inflationary epoch. In other models, the electroweak epoch is said to begin after the inflationary epoch ended, at roughly 10−32 seconds. According to traditional big bang cosmology, the electroweak epoch began 10−36 seconds after the Big Bang, when the temperature of the universe was low enough (1028 K) for the Electronuclear Force to begin to manifest as two separate interactions, called the strong and the electroweak interactions. (The electroweak interaction will also separate later, dividing into the electromagnetic and weak interactions). The exact point where electrostrong symmetry was broken is not certain, because of the very high energies of this event. At this point of the very early universe, the metric that defines distance within space, suddenly and very rapidly changed in scale, leaving the early universe at least 1078 times its previous volume (and possibly much more). This is equivalent to a linear increase of at least 1026 times in every spatial dimension – equivalent to an object 1 nanometer (10−9 m, about half the width of a molecule of DNA) in length, expanding to one approximately 10.6 light years (about 62 trillion miles) long in a tiny fraction of a second. This change is known as inflation. Although light and objects within spacetime cannot travel faster than the speed of light, in this case it was the metric governing the size and geometry of spacetime itself that changed in scale. Changes to the metric are not limited by the speed of light. There is good evidence that this happened, and it is widely accepted that it did take place. But the exact reasons why it happened are still being explored. So a range of models exist that explain why and how it took place - it is not yet clear which explanation is correct. In several of the more prominent models, it is thought to have been triggered by the separation of the strong and electroweak interactions which ended the grand unification epoch. One of the theoretical products of this phase transition was a scalar field called the inflaton field. As this field settled into its lowest energy state throughout the universe, it generated an enormous repulsive force that led to a rapid expansion of the metric that defines space itself. Inflation explains several observed properties of the current universe that are otherwise difficult to account for, including explaining how today's universe has ended up so exceedingly homogeneous (similar) on a very large scale, even though it was highly disordered in its earliest stages. It is not known exactly when the inflationary epoch ended, but it is thought to have been between 10−33 and 10−32 seconds after the Big Bang. The rapid expansion of space meant that elementary particles remaining from the grand unification epoch were now distributed very thinly across the universe. However, the huge potential energy of the inflation field was released at the end of the inflationary epoch, as the inflaton field decayed into other particles, known as "reheating". This heating effect led to the universe being repopulated with a dense, hot mixture of quarks, anti-quarks and gluons. In other models, reheating is often considered to mark the start of the electroweak epoch, and some theories, such as warm inflation, avoid a reheating phase entirely. In non-traditional versions of Big Bang theory (known as "inflationary" models), inflation ended at a temperature corresponding to roughly 10−32 second after the Big Bang, but this does not imply that the inflationary era lasted less than 10−32 second. To explain the observed homogeneity of the universe, the duration in these models must be longer than 10−32 second. Therefore, in inflationary cosmology, the earliest meaningful time "after the Big Bang" is the time of the end of inflation. After inflation ended, the universe continued to expand, but at a very slow rate. The slow expansion began to speed up after several billion years, believed to be due to dark energy, and is still expanding today. On March 17, 2014, astrophysicists of the BICEP2 collaboration announced the detection of inflationary gravitational waves in the B-mode power spectrum which was interpreted as clear experimental evidence for the theory of inflation. However, on June 19, 2014, lowered confidence in confirming the cosmic inflation findings was reported  and finally, on February 2, 2015, a joint analysis of data from BICEP2/Keck and Planck satellite concluded that the statistical "significance [of the data] is too low to be interpreted as a detection of primordial B-modes" and can be attributed mainly to polarized dust in the Milky Way. As a side-effect, the weak force and electromagnetic force, and their respective bosons (the W and Z bosons and photon) now begin to manifest differently in the present universe. Before electroweak symmetry breaking these bosons were all massless particles and interacted over long distances, but at this point the W and Z bosons abruptly become massive particles only interacting over distances smaller than the size of an atom, while the photon remains massless and remains a long-distance interaction. After electroweak symmetry breaking, the fundamental interactions we know of – gravitation, electromagnetism, the strong interaction and the weak interaction – have all taken their present forms, and fundamental particles have mass, but the temperature of the universe is still too high to allow the formation of many fundamental particles we now see in the universe. If supersymmetry is a property of our universe, then it must be broken at an energy that is no lower than 1 TeV, the electroweak scale. The masses of particles and their superpartners would then no longer be equal. This very high energy could explain why no superpartners of known particles have ever been observed. After cosmic inflation ends, the universe is filled with a hot quark–gluon plasma, the remains of reheating. From this point onwards the physics of the early universe is much better understood, and the energies involved in the Quark epoch are directly accessible in particle physics experiments and other detectors. The quark epoch began approximately 10−12 seconds after the Big Bang. This was the period in the evolution of the early universe immediately after electroweak symmetry breaking, when the fundamental interactions of gravitation, electromagnetism, the strong interaction and the weak interaction had taken their present forms, but the temperature of the universe was still too high to allow quarks to bind together to form hadrons. During the quark epoch the universe was filled with a dense, hot quark–gluon plasma, containing quarks, leptons and their antiparticles. Collisions between particles were too energetic to allow quarks to combine into mesons or baryons. The quark epoch ended when the universe was about 10−6 seconds old, when the average energy of particle interactions had fallen below the binding energy of hadrons. Baryons are subatomic particles such as protons and neutrons, that are composed of three quarks. It would be expected that both baryons, and particles known as antibaryons would have formed in equal numbers. However, this does not seem to be what happened – as far as we know, the universe was left with far more baryons than antibaryons. In fact, almost no antibaryons are observed in nature. It is not clear how this came about. Any explanation for this phenomenon must allow the Sakharov conditions related to baryogenesis to have been satisfied at some time after the end of cosmological inflation. Current particle physics suggests asymmetries under which these conditions would be met, but these asymmetries appear to be too small to account for the observed baryon-antibaryon asymmetry of the universe. The quark–gluon plasma that composes the universe cools until hadrons, including baryons such as protons and neutrons, can form. Initially, hadron/anti-hadron pairs could form, so matter and anti-matter were in thermal equilibrium. However, as the temperature of the universe continued to fall, new hadron/anti-hadron pairs were no longer produced, and most of the newly formed hadrons and anti-hadrons annihilated each other, giving rise to pairs of high-energy photons. A comparatively small residue of hadrons remained at about 1 second of cosmic time, when this epoch ended. Theory predicts that about 1 neutron remained for every 7 protons. We believe this to be correct because, at a later stage, all the neutrons and some of the protons fused, leaving hydrogen, a hydrogen isotope called deuterium, helium and other elements, which we can measure. A 1:7 ratio of hadrons at the end of this epoch would indeed produce the observed element ratios in the early as well as current universe. At approximately 1 second after the Big Bang neutrinos decouple and begin traveling freely through space. As neutrinos rarely interact with matter, these neutrinos still exist today, analogous to the much later cosmic microwave background emitted during recombination, around 377,000 years after the Big Bang. The neutrinos from this event have a very low energy, around 10−10 times smaller than is possible with present-day direct detection. Even high energy neutrinos are notoriously difficult to detect, so this cosmic neutrino background (CNB) may not be directly observed in detail for many years, if at all. However, Big Bang cosmology makes many predictions about the CNB, and there is very strong indirect evidence that the cosmic neutrino background exists, both from Big Bang nucleosynthesis predictions of the helium abundance, and from anisotropies in the cosmic microwave background. One of these predictions is that neutrinos will have left a subtle imprint on the cosmic microwave background (CMB). It is well known that the CMB has irregularities. Some of the CMB fluctuations were roughly regularly spaced, because of the effect of baryonic acoustic oscillations. In theory, the decoupled neutrinos should have had a very slight effect on the phase of the various CMB fluctuations. In 2015, it was reported that such shifts had been detected in the CMB. Moreover, the fluctuations corresponded to neutrinos of almost exactly the temperature predicted by Big Bang theory (1.96 +/-0.02K compared to a prediction of 1.95K), and exactly three types of neutrino, the same number of neutrino flavours currently predicted by the Standard Model. Primordial black holes are a hypothetical type of black hole proposed in 1966, that may have formed during the so-called radiation dominated era, due to the high densities and inhomogeneous conditions within the first second of cosmic time. Random fluctuations could lead to some regions becoming dense enough to undergo gravitational collapse, forming black holes. Current understandings and theories place tight limits on the abundance and mass of these objects. is the average density of the Universe. Several mechanisms could produce dense regions meeting this criterion during the early universe, including reheating, cosmological phase transitions and (in so-called "hybrid inflation models") axion inflation. Since primordial black holes didn't form from stellar gravitational collapse, their masses can be far below stellar mass (~2×1033 g). Stephen Hawking calculated in 1971 that primordial black holes could weigh as little as 10−5 g. But they can have any size, so they could also be large, and may have contributed to the formation of galaxies. The majority of hadrons and anti-hadrons annihilate each other at the end of the hadron epoch, leaving leptons (such as the electron, muons and certain neutrinos) and anti-leptons, dominating the mass of the universe. The lepton epoch follows a similar path to the earlier hadron epoch. Initially leptons and anti-leptons are produced in pairs. About 10 seconds after the Big Bang the temperature of the universe falls to the point at which new lepton/anti-lepton pairs are no longer created and most remaining leptons and anti-leptons quickly annihilate each other, giving rise to pairs of high energy photons, and leaving a small residue of non-annihilated leptons. After most leptons and anti-leptons are annihilated at the end of the lepton epoch, most of the mass-energy in the universe is left in the form of photons. (Much of the rest of its mass-energy is in the form of neutrinos and other relativistic particles). Therefore, the energy of the universe, and its overall behavior, is dominated by its photons. These photons continue to interact frequently with charged particles, i.e., electrons, protons and (eventually) nuclei. They continue to do so for about the next 377,000 years. Between about 2 and 20 minutes after the Big Bang, the temperature and pressure of the universe allow nuclear fusion to occur, giving rise to nuclei of a few light elements beyond hydrogen ("Big Bang nucleosynthesis"). About 25% of the protons, and all the neutrons fuse to form deuterium, a hydrogen isotope, and most of the deuterium quickly fuses to form helium-4. Atomic nuclei will easily unbind (break apart) above a certain temperature, related to their binding energy. From about 2 minutes, the falling temperature means that deuterium no longer unbinds, and is stable, and starting from about 3 minutes, helium and other elements formed by the fusion of deuterium also no longer unbind and are stable. The short duration and falling temperature means that only the simplest and fastest fusion processes can occur. Only tiny amounts of nuclei beyond helium are formed, because nucleosynthesis of heavier elements is difficult and requires thousands of years even in stars. Small amounts of tritium (another hydrogen isotope) and beryllium-7 and -8 are formed, but these are unstable and are quickly lost again. A small amount of deuterium is left unfused because of the very short duration. Therefore, the only stable nuclides created by the end of Big Bang nucleosynthesis are protium (single proton/hydrogen nucleus), deuterium, helium-3, helium-4, and lithium-7. By mass, the resulting matter is about 75% hydrogen nuclei, 25% helium nuclei, and perhaps 10−10 by mass of Lithium-7. The next most common stable isotopes produced are lithium-6, beryllium-9, boron-11, carbon, nitrogen and oxygen ("CNO"), but these have predicted abundances of between 5 and 30 parts in 1015 by mass, making them essentially undetectable and negligible. The amounts of each light element in the early universe can be estimated from old galaxies, and is strong evidence for the Big Bang. For example, the Big Bang should produce about 1 neutron for every 7 protons, allowing for 25% of all nucleons to be fused into helium-4 (2 protons and 2 neutrons out of every 16 nucleons), and this is the amount we find today, and far more than can be easily explained by other processes. Similarly, deuterium fuses extremely easily; any alternative explanation must also explain how conditions existed for deuterium to form, but also left some of that deuterium unfused and not immediately fused again into helium. Any alternative must also explain the proportions of the various light elements and their isotopes. A few isotopes, such as lithium-7, were found to be present in amounts that differed from theory, but over time, these differences have been resolved by better observations. Until now, the universe's large scale dynamics and behavior have been determined mainly by radiation – meaning, those constituents that move relativistically (at or near the speed of light), such as photons and neutrinos. As the universe cools, from around 47,000 years (z=3600), the universe's large scale behavior becomes dominated by matter instead. This occurs because the energy density of matter begins to exceed both the energy density of radiation and the vacuum energy density. Around or shortly after 47,000 years, the densities of non-relativistic matter (atomic nuclei) and relativistic radiation (photons) become equal, the Jeans length, which determines the smallest structures that can form (due to competition between gravitational attraction and pressure effects), begins to fall and perturbations, instead of being wiped out by free-streaming radiation, can begin to grow in amplitude. According to the Lambda-CDM model, by this stage, the matter in the universe is around 84.5% cold dark matter and 15.5% "ordinary" matter. (However the total matter in the universe is only 31.7%, much smaller than the 68.3% of dark energy). There is overwhelming evidence that dark matter exists and dominates our universe, but since the exact nature of dark matter is still not understood, the Big Bang theory does not presently cover any stages in its formation. From this point on, and for several billion years to come, the presence of dark matter accelerates the formation of structure in our universe. In the early universe, dark matter gradually gathers in huge filaments under the effects of gravity. This amplifies the tiny inhomogeneities (irregularities) in the density of the universe which was left by cosmic inflation. Over time, slightly denser regions become denser and slightly rarefied (emptier) regions become more rarefied. Ordinary matter eventually gathers together faster than it would otherwise do, because of the presence of these concentrations of dark matter. About 377,000 years after the Big Bang, two connected events occurred: recombination and photon decoupling. Recombination describes the ionized particles combining to form the first neutral atoms, and decoupling refers to the photons released ("decoupled") as the newly formed atoms settle into more stable energy states. Just before recombination, the baryonic matter in the universe was at a temperature where it formed a hot ionized plasma. Most of the photons in the universe interacted with electrons and protons, and could not travel significant distances without interacting with ionized particles. As a result, the universe was opaque or "foggy". Although there was light, it was not possible to see, nor can we observe that light through telescopes. At around 377,000 years, the universe has cooled to a point where free electrons can combine with the hydrogen and helium nuclei to form neutral atoms. This process is relatively fast (and faster for the helium than for the hydrogen), and is known as recombination. The name is slightly inaccurate and is given for historical reasons: in fact the electrons and atomic nuclei were combining for the first time. Directly combining in a low energy state (ground state) is less efficient, so these hydrogen atoms generally form with the electrons still in a high energy state, and once combined, the electrons quickly release energy in the form of one or more photons as they transition to a low energy state. This release of photons is known as photon decoupling. Some of these decoupled photons are captured by other hydrogen atoms, the remainder remain free. By the end of recombination, most of the protons in the universe have formed neutral atoms. This change from charged to neutral particles means that the mean free path photons can travel before capture in effect becomes infinite, so any decoupled photons that have not been captured can travel freely over long distances (see Thomson scattering). The universe has become transparent to visible light, radio waves and other electromagnetic radiation for the first time in its history. The background of this box approximates the original 4000K color of the photons released during decoupling, before they became redshifted to form the cosmic microwave background. The universe would have appeared as a brilliantly glowing fog of a color similar to this, at the time. The photons released by these newly formed hydrogen atoms initially had a temperature/energy of around ~ 4000 K. This would have been visible to the eye as a pale yellow/orange tinted, or "soft", white color. Over billions of years since decoupling, as the universe has expanded, the photons have been red-shifted from visible light to radio waves (microwave radiation corresponding to a temperature of about 2.7 K). Red shifting describes the photons acquiring longer wavelengths and lower frequencies as the universe expanded over billions of years, so that they gradually changed from visible light to radio waves. These same photons can still be detected as radio waves today. They form the cosmic microwave background ("CMB"), and they provide crucial evidence of the early universe and how it developed. Around the same time as recombination, existing pressure waves within the electron-baryon plasma – known as baryon acoustic oscillations – became embedded in the distribution of matter as it condensed, giving rise to a very slight preference in distribution of large-scale objects. Therefore, the cosmic microwave background is a picture of the universe at the end of this epoch including the tiny fluctuations generated during inflation (see diagram), and the spread of objects such as galaxies in the universe is an indication of the scale and size of the universe as it developed over time. After recombination and decoupling, the universe was transparent and had cooled enough to allow light to travel long distances, but there were no light-producing structures such as stars and galaxies. Stars and galaxies are formed when dense regions of gas form due to the action of gravity, and this takes a long time within a near-uniform density of gas and on the scale required, so it is estimated that stars did not exist for perhaps hundreds of millions of years after recombination. This period, known as the Dark Ages, began around 377,000 years after the Big Bang. During the Dark Ages, the temperature of the universe cooled from some 4000 K down to about 60 K, and only two sources of photons existed: the photons released during recombination/decoupling (as neutral hydrogen atoms formed), which we can still detect today as the cosmic microwave background (CMB), and photons occasionally released by neutral hydrogen atoms, known as the 21 cm spin line of neutral hydrogen. The hydrogen spin line is in the microwave range of frequencies, and within 3 million years, the CMB photons had redshifted out of visible light to infrared; from that time until the first stars, there were no visible light photons. Other than perhaps some rare statistical anomalies, the universe was truly dark. The October 2010 discovery of UDFy-38135539, the first observed galaxy to have existed during the following reionization epoch, gives us a window into these times. Subsequently, Leiden University's Richard J. Bouwens and Garth D. Illingsworth from UC Observatories/Lick Observatory found the galaxy UDFj-39546284 to be even older, at a time some 480 million years after the Big Bang or about halfway through the Cosmic Dark Ages at a distance of about 13.2 billion light-years. Next, the UDFy-38135539, EGSY8p7 and GN-z11 galaxies were found to be around 380–550 million years after the Big Bang and at a distance of around 13.4 billion light-years. There is also currently an observational effort underway to detect the faint 21 cm spin line radiation, as it is in principle an even more powerful tool than the cosmic microwave background for studying the early universe. Structures may have begun to emerge from around 150 million years, and stars and early galaxies gradually emerged from around 400 to 700 million years. As they emerged, the Dark Ages gradually ended. Because this process was gradual, the Dark Ages only fully ended around 1 billion (1000 million) years, as the universe took its present appearance. For about 6.6 million years, between about 10 to 17 million years after the Big Bang (redshift 137–100), the background temperature was between 373 K and 273 K, a temperature compatible with liquid water and common biological chemical reactions. Loeb (2014) speculated that primitive life might in principle have appeared during this window, which he called "the Habitable Epoch of the Early Universe". Loeb argues that carbon-based life might have evolved in a hypothetical pocket of the early universe that was dense enough both to generate at least one massive star that subsequently releases carbon in a supernova, and that was also dense enough to generate a planet. (Such dense pockets, if they existed, would have been extremely rare.) Life would also have required a heat differential, rather than just uniform background radiation; this could be provided by naturally-occurring geothermal energy. Such life would likely have remained primitive; it is highly unlikely that intelligent life would have had sufficient time to evolve before the hypothetical oceans freeze over at the end of the habitable epoch. The matter in the universe is around 84.5% cold dark matter and 15.5% "ordinary" matter. Since the start of the matter-dominated era, the dark matter has gradually been gathering in huge spread out (diffuse) filaments under the effects of gravity. Ordinary matter eventually gathers together faster than it would otherwise do, because of the presence of these concentrations of dark matter. It is also slightly more dense at regular distances due to early baryon acoustic oscillations (BAO) which became embedded into the distribution of matter when photons decoupled. Unlike dark matter, ordinary matter can lose energy by many routes, which means that as it collapses, it can lose the energy which would otherwise hold it apart, and collapse more quickly, and into denser forms. Ordinary matter gathers where dark matter is denser, and in those places it collapses into clouds of mainly hydrogen gas. The first stars and galaxies form from these clouds. Where numerous galaxies have formed, galaxy clusters and superclusters will eventually arise. 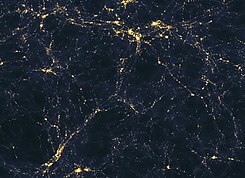 Large voids with few stars will develop between them, marking where dark matter became less common. Structure formation in the big bang model proceeds hierarchically, due to gravitational collapse, with smaller structures forming before larger ones. The earliest structures to form are the first stars (known as population III stars), dwarf galaxies, and quasars (which are thought to be bright, early active galaxies containing a supermassive black hole surrounded by an inward-spiralling accretion disk of gas). Before this epoch, the evolution of the universe could be understood through linear cosmological perturbation theory: that is, all structures could be understood as small deviations from a perfect homogeneous universe. This is computationally relatively easy to study. At this point non-linear structures begin to form, and the computational problem becomes much more difficult, involving, for example, N-body simulations with billions of particles. The Bolshoi Cosmological Simulation is a high precision simulation of this era. These Population III stars are also responsible for turning the few light elements that were formed in the Big Bang (hydrogen, helium and small amounts of lithium) into many heavier elements. They can be huge as well as perhaps small – and non-metallic (no elements except hydrogen and helium). The larger stars have very short lifetimes compared to most Main Sequence stars we see today, so they commonly finish burning their hydrogen fuel and explode as supernovae after mere millions of years, seeding the universe with heavier elements over repeated generations. They mark the start of the Stelliferous (starry) era. As yet, no Population III stars have been found, so our understanding of them is based on computational models of their formation and evolution. Fortunately, observations of the Cosmic Microwave Background radiation can be used to date when star formation began in earnest. Analysis of such observations made by the European Space Agency's Planck telescope in 2016 concluded that the first generation of stars formed 700 million years after the Big Bang. Quasars provides some additional evidence of early structure formation. Their light shows evidence of elements such as carbon, magnesium, iron and oxygen. This is evidence that by the time quasars formed, a massive phase of star formation had already taken place, including sufficient generations of population III stars to give rise to these elements. As the first stars, dwarf galaxies and quasars gradually form, the intense radiation they emit reionizes much of the surrounding universe; splitting the neutral hydrogen atoms back into a plasma of free electrons and protons for the first time since recombination and decoupling. Reionization is evidenced from observations of quasars. Quasars are a form of active galaxy, and the most luminous objects observed in the universe. Electrons in neutral hydrogen have a specific patterns of absorbing photons, related to electron energy levels and called the Lyman series. Ionized hydrogen does not have electron energy levels of this kind. Therefore, light travelling through ionized hydrogen and neutral hydrogen shows different absorption lines. In addition, the light will have travelled for billions of years to reach us, so any absorption by neutral hydrogen will have been redshifted by varied amounts, rather than by one specific amount, indicating when it happened. These features make it possible to study the state of ionization at many different times in the past. They show that reionization began as "bubbles" of ionized hydrogen which became larger over time. They also show that the absorption was due to the general state of the universe (the intergalactic medium) and not due to passing through galaxies or other dense areas. Reionization might have started as early as z=16 (250 million years of cosmic time) and was complete by around z=9 or 10 (500 million years). The epoch of reionization probably ended by around z=5 or 6 (1 billion years) as the era of Population III stars and quasars – and their intense radiation – came to an end, and the ionized hydrogen gradually reverted to neutral atoms. These observations have narrowed down the period of time during which reionization took place, but the source of the photons that caused reionization is still not completely certain. To ionize neutral hydrogen, an energy larger than 13.6 eV is required, which corresponds to ultraviolet photons with a wavelength of 91.2 nm or shorter, implying that the sources must have produced significant amount of ultraviolet and higher energy. Protons and electrons will recombine if energy is not continuously provided to keep them apart, which also sets limits on how numerous the sources were and their longevity. With these constraints, it is expected that quasars and first generation stars and galaxies were the main sources of energy. The current leading candidates from most to least significant are currently believed to be population III stars (the earliest stars) (possibly 70%), dwarf galaxies (very early small high-energy galaxies) (possibly 30%), and a contribution from quasars (a class of active galactic nuclei). However, by this time, matter had become far more spread out due to the ongoing expansion of the universe. Although the neutral hydrogen atoms were again ionized, the plasma was much more thin and diffuse, and photons were much less likely to be scattered. Despite being reionized, the universe remained largely transparent during reionization. As the universe continued to cool and expand, reionization gradually ended. 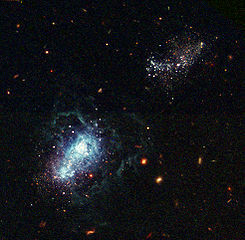 Matter continues to draw together under the influence of gravity, to form galaxies. The stars from this time period, known as Population II stars, are formed early on in this process, with more recent Population I stars formed later. Gravitational attraction also gradually pulls galaxies towards each other to form groups, clusters and superclusters. The Hubble Ultra Deep Field observatory has identified a number of small galaxies merging to form larger ones, at 800 million years of cosmic time (13 billion years ago) (this age estimate is now believed to be slightly overstated). Johannes Schedler's project has identified a quasar CFHQS 1641+3755 at 12.7 billion light-years away, when the universe was just 7% of its present age. On July 11, 2007, using the 10-metre Keck II telescope on Mauna Kea, Richard Ellis of the California Institute of Technology at Pasadena and his team found six star forming galaxies about 13.2 billion light years away and therefore created when the universe was only 500 million years old. Only about 10 of these extremely early objects are currently known. More recent observations have shown these ages to be shorter than previously indicated. The most distant galaxy observed as of October 2016, GN-z11, has been reported to be 32 billion light years away, a vast distance made possible through space-time expansion (redshift z=11.1; comoving distance of 32 billion light-years; lookback time of 13.4 billion years). The universe has appeared much the same as it does now, for many billions of years. It will continue to look similar for many more billions of years into the future. From about 9.8 billion years of cosmic time, the universe's large-scale behavior is believed to have gradually changed for the third time in its history. Its behavior had originally been dominated by radiation (relativistic constituents such as photons and neutrinos) for the first 47,000 years, and since about 377,000 years of cosmic time, its behavior had been dominated by matter. During its matter-dominated era, the expansion of the universe had begun to slow down, as gravity reigned in the initial outward expansion. But from about 9.8 billion years of cosmic time, observations show that that the expansion of the universe slowly stops decelerating, and gradually begins to accelerate again, instead. While the precise cause is not known, the observation is accepted as correct by the cosmologist community. By far the most accepted understanding is that this is due to an unknown form of energy which has been given the name "dark energy". "Dark" in this context means that it is not directly observed, but can currently only be studied by examining the effect it has on the universe. Research is ongoing to understand this dark energy. Dark energy is now believed to be the single largest component of the universe, as it constitutes about 68.3% of the entire mass-energy of the physical universe. Dark energy is believed to act like a cosmological constant - a scalar field that exists throughout space. Unlike gravity, the effects of such a field do not diminish (or only diminish slowly) as the universe grows. While matter and gravity have a greater effect initially, their effect quickly diminishes as the universe continues to expand. Objects in the universe, which are initially seen to be moving apart as the universe expands, continue to move apart, but their outward motion gradually slows down. This slowing effect becomes smaller as the universe becomes more spread out. Eventually, the outward and repulsive effect of dark energy begins to dominate over the inward pull of gravity. Instead of slowing down and perhaps beginning to move inward under the influence of gravity, from about 9.8 billion years of cosmic time, the expansion of space starts to slowly accelerate outward at a gradually increasing rate. The universe has existed for around 13.8 billion years, and we believe that we understand it well enough to predict its large-scale development for many billions of years into the future – perhaps as much as 100 billion years of cosmic time (about 86 billion years from now). Beyond that, we need to better understand the universe to make any accurate predictions. Therefore, the universe could follow a variety of different paths beyond this time. There are several competing scenarios for the possible long-term evolution of the universe. Which of them will happen, if any, depends on the precise values of physical constants such as the cosmological constant, the possibility of proton decay, the energy of the vacuum (meaning, the energy of "empty" space itself), and the natural laws beyond the Standard Model. If the expansion of the universe continues and it stays in its present form, eventually all but the nearest galaxies will be carried away from us by the expansion of space at such a velocity that our observable universe will be limited to our own gravitationally bound local galactic cluster. In the very long term (after many trillions – thousands of billions – of years, cosmic time), the Stelliferous Era will end, as stars cease to be born and even the longest-lived stars gradually die. Beyond this, all objects in the universe will cool and (with the possible exception of protons) gradually decompose back to their constituent particles and then into subatomic particles and very low level photons and other fundamental particles, by a variety of possible processes. Ultimately, in the extreme future, the following scenarios have been proposed for the ultimate fate of the universe. Heat Death As expansion continues, the universe becomes larger, colder, and more dilute; in time, all structures eventually decompose to subatomic particles and photons. In the case of indefinitely continuing metric expansion of space, the energy density in the universe will decrease until, after an estimated time of 101000 years, it reaches thermodynamic equilibrium and no more structure will be possible. This will happen only after an extremely long time because first, all matter will collapse into black holes, which will then evaporate extremely slowly via Hawking radiation. The universe in this scenario will cease to be able to support life much earlier than this, after some 1014 years or so, when star formation ceases., §IID. In some grand unified theories, proton decay after at least 1034 years will convert the remaining interstellar gas and stellar remnants into leptons (such as positrons and electrons) and photons. Some positrons and electrons will then recombine into photons., §IV, §VF. In this case, the universe has reached a high-entropy state consisting of a bath of particles and low-energy radiation. It is not known however whether it eventually achieves thermodynamic equilibrium., §VIB, VID. The hypothesis of a universal heat death stems from the 1850s ideas of William Thomson (Lord Kelvin) who extrapolated the theory of heat views of mechanical energy loss in nature, as embodied in the first two laws of thermodynamics, to universal operation. Big Rip Expansion of space accelerates and at some point becomes so extreme that even subatomic particles and the fabric of spacetime are pulled apart and unable to exist. For sufficiently large values for the dark energy content of the universe, the expansion rate of the universe will continue to increase without limit. Gravitationally bound systems, such as clusters of galaxies, galaxies, and ultimately the Solar System will be torn apart. Eventually the expansion will be so rapid as to overcome the electromagnetic forces holding molecules and atoms together. Even atomic nuclei will be torn apart. Finally, forces and interactions even on the Planck scale – the smallest size for which the notion of "space" currently has a meaning – will no longer be able to occur as the fabric of spacetime itself is pulled apart and the universe as we know it will end in an unusual kind of singularity. Big Crunch Expansion eventually slows and halts, then reverses as all matter accelerates towards its common centre. Not now considered likely. In the opposite of the "Big Rip" scenario, the metric expansion of space would at some point be reversed and the universe would contract towards a hot, dense state. This is a required element of oscillatory universe scenarios, such as the cyclic model, although a Big Crunch does not necessarily imply an oscillatory universe. Current observations suggest that this model of the universe is unlikely to be correct, and the expansion will continue or even accelerate. Vacuum instability Collapse of the quantum fields that underpin all forces, particles and structures, to a different form. Cosmology traditionally has assumed a stable or at least metastable universe, but the possibility of a false vacuum in quantum field theory implies that the universe at any point in spacetime might spontaneously collapse into a lower energy state (see Bubble nucleation), a more stable or "true vacuum", which would then expand outward from that point with the speed of light. The effect would be that the quantum fields that underpin all forces, particles and structures, would undergo a transition to a more stable form. New forces and particles would replace the present ones we know of, with the side effect that all current particles, forces and structures would be destroyed and subsequently (if able) reform into different particles, forces and structures. In this kind of extreme timescale, extremely rare quantum phenomena may also occur that are extremely unlikely to be seen on a timescale smaller than trillions of years. These may also lead to unpredictable changes to the state of the universe which would not be likely to be significant on any smaller timescale. For example, on a timescale of millions of trillions of years, black holes might appear to evaporate almost instantly, uncommon quantum tunneling phenomena would appear to be common, and quantum (or other) phenomena so unlikely that they might occur just once in a trillion years may occur many times. 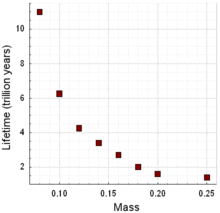 ^ The Planck Collaboration in 2015 published the estimate of 13.799 ± 0.021 billion years ago (68% confidence interval). See Table 4 on page 31 of pdf. Planck Collaboration (2016). "Planck 2015 results. XIII. Cosmological parameters". Astronomy & Astrophysics. 594 (13): A13. arXiv:1502.01589. Bibcode:2016A&A...594A..13P. doi:10.1051/0004-6361/201525830. ^ a b c Loeb, Abraham (October 2014). "The Habitable Epoch of the Early Universe". International Journal of Astrobiology. 13 (4): 337–339. arXiv:1312.0613. Bibcode:2014IJAsB..13..337L. CiteSeerX 10.1.1.748.4820. doi:10.1017/S1473550414000196. Retrieved 15 December 2014. ^ a b del Peloso, E. F.; da Silva, L.; Porto de Mello, G. F.; Arany-Prado, L. I. (2005). "The age of the Galactic thin disk from Th/Eunucleocosmochronology. III. Extended sample". Astronomy & Astrophysics. 440 (3): 1153–1159. arXiv:astro-ph/0506458. Bibcode:2005A&A...440.1153D. doi:10.1051/0004-6361:20053307. ^ Guth, "Phase transitions in the very early universe", in: Hawking, Gibbon, Siklos (eds. ), The Very Early Universe (1985). ^ Overbye, Dennis (March 17, 2014). "Space Ripples Reveal Big Bang's Smoking Gun". The New York Times. Retrieved March 17, 2014. ^ Overbye, Dennis (March 24, 2014). "Ripples From the Big Bang". The New York Times. Retrieved March 24, 2014. ^ a b Ade, P. A. R.; et al. (BICEP2 Collaboration) (2014). "Detection of B-Mode Polarization at Degree Angular Scales by BICEP2". Physical Review Letters. 112 (24): 241101. arXiv:1403.3985. Bibcode:2014PhRvL.112x1101B. doi:10.1103/PhysRevLett.112.241101. PMID 24996078. ^ Woit, Peter (13 May 2014). "Not Even Wrong". BICEP2 News. Retrieved 22 September 2018. ^ Overbye, Dennis (June 19, 2014). "Astronomers Hedge on Big Bang Detection Claim". The New York Times. Retrieved June 20, 2014. ^ Amos, Jonathan (June 19, 2014). "Cosmic inflation: Confidence lowered for Big Bang signal". BBC News. Retrieved June 20, 2014. ^ Ade, P. A. R.; et al. (BICEP2/Keck, Planck Collaborations) (2015). "A Joint Analysis of BICEP2/Keck Array and Planck Data". Physical Review Letters. 114 (10): 101301. arXiv:1502.00612. Bibcode:2015PhRvL.114j1301B. doi:10.1103/PhysRevLett.114.101301. PMID 25815919. ^ "Gravitational waves from early universe remain elusive". Science Daily. 31 January 2015. Retrieved 3 February 2015.
is the Fermi coupling constant), it's not the symmetry breaking energy scale. ^ a b c d e f g h i Karki, Ravi (May 2010). "The Foreground of Big Bang Nucleosynthesis". The Himalayan Physics. 1 (1). Retrieved 21 September 2018. ^ a b c d Cosmic Neutrinos Detected, Confirming The Big Bang's Last Great Prediction – Forbes coverage of original paper: Follin, Brent; Knox, Lloyd; Millea, Marius; Pan, Zhen (26 August 2015). "First Detection of the Acoustic Oscillation Phase Shift Expected from the Cosmic Neutrino Background". Physical Review Letters. 115 (9): 091301. arXiv:1503.07863. Bibcode:2015PhRvL.115i1301F. doi:10.1103/PhysRevLett.115.091301. PMID 26371637. ^ Zel'dovitch & Novikov (14 March 1966). "The Hypothesis of Cores Retarded During Expansion and the Hot Cosmological Model". Astronomicheskii Zhurnal. 10 (4): 602–603. Bibcode:1966AZh....43..758Z. ^ Harada, T.; Yoo, C.-M.; Khori, K. (2013). "Threshold of primordial black hole formation". Physical Review D. 88 (8): 084051. arXiv:1309.4201. Bibcode:2013PhRvD..88h4051H. doi:10.1103/PhysRevD.88.084051. ^ "The Timescale of Creation". Knowledge tree project. Archived from the original on 28 July 2009. ^ Wright, Edward L. (26 September 2012). "Detailed timeline of Big Bang nucleosynthesis processes". astro.ucla.edu. Retrieved 21 September 2018. ^ Ryden, Barbara (12 March 2003). "Astronomy 162 — Lecture 44: The first three minutes". astronomy.ohio-state.edu. Retrieved 21 September 2018. ^ Kusakabe, Motohiko; et al. (2014). "Revised Big Bang Nucleosynthesis with long-lived negatively charged massive particles: Impact of new 6Li limits, primordial 9Be nucleosynthesis, and updated recombination rates". The Astrophysical Journal Supplement Series. 214 (1): 5. arXiv:1403.4156. Bibcode:2014ApJS..214....5K. doi:10.1088/0067-0049/214/1/5. ^ Coc, A (2017). "Primordial Nucleosynthesis". Journal of Physics: Conference Series. 665 (10102): 012001. arXiv:1609.06048. doi:10.1088/1742-6596/665/1/012001. ^ Coc, Alain; Uzan, Jean-Philippe; Vangioni, Elisabeth (2014). "Standard big bang nucleosynthesis and primordial CNO Abundances after Planck". Journal of Cosmology and Astroparticle Physics. 2014 (10): 050. arXiv:1403.6694. Bibcode:2014JCAP...10..050C. doi:10.1088/1475-7516/2014/10/050. ^ Bennett, C. L.; et al. (2013). "Nine-Year Wilkinson Microwave Anisotropy Probe (WMAP) Observations: Final Maps and Results". The Astrophysical Journal Supplement Series. 208 (2): 20. arXiv:1212.5225. Bibcode:2013ApJS..208...20B. doi:10.1088/0067-0049/208/2/20. ^ Hinshaw, G.; et al. (2009). "Five-Year Wilkinson Microwave Anisotropy Probe (WMAP) Observations: Data Processing, Sky Maps, and Basic Results" (PDF). Astrophysical Journal Supplement. 180 (2): 225–245. arXiv:0803.0732. Bibcode:2009ApJS..180..225H. doi:10.1088/0067-0049/180/2/225. ^ "Color temperature chart". Media college. Retrieved 21 September 2018. ^ Amos, Jonathan (2012-11-13). "Quasars illustrate dark energy's roller coaster ride". BBC News. Retrieved 13 November 2012. ^ www.sciam.com. "The Dark Ages" (PDF). pp. physically 4–5 (listed as 48–49). ^ Loeb, Abraham (December 2013). "The Habitable Epoch of the Early Universe". International Journal of Astrobiology. 13 (4): 337–339. arXiv:1312.0613. Bibcode:2014IJAsB..13..337L. CiteSeerX 10.1.1.748.4820. doi:10.1017/S1473550414000196. ^ Merali, Zeeya (10 December 2013). "Life possible in the early Universe". Nature. pp. 201–201. doi:10.1038/504201a. Retrieved 4 November 2018. ^ a b c Dijkstra, Mark (5 August 2014). "Lyα Emitting Galaxies as a Probe of Reionization". Publications of the Astronomical Society of Australia. 31: e040. arXiv:1406.7292. Bibcode:2014PASA...31...40D. doi:10.1017/pasa.2014.33. ^ Loeb; Barkana (2001). "In the Beginning: The First Sources of Light and the Reionization of the Universe". Physics Reports. 349 (2): 125–238. arXiv:astro-ph/0010468. Bibcode:2001PhR...349..125B. doi:10.1016/S0370-1573(01)00019-9. ^ Andrew Pontzen and Hiranya Peiris, Illuminating illumination: what lights up the universe?, UCLA press release, 27 August 2014. 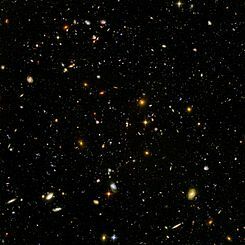 ^ "Astronomy picture of the day – The Hubble Ultra Deep Field". NASA. 9 March 2004. Retrieved 22 September 2018. ^ Landau, Elizabeth (25 October 2013). "Scientists confirm most distant galaxy ever". CNN. Retrieved 21 September 2018. ^ "Astronomy picture of the day – Time Tunnel". NASA. 6 September 2007. Retrieved 22 September 2018. ^ Shiga, David (14 July 2007). "Dark matter mapped in 3D for first time". New Scientist. Retrieved 22 September 2018. ^ "Hobby-Eberly Telescope Helps Astronomers Learn Secrets of One of Universe's Most Distant Objects". McDonald Observatory. 8 July 2007. Retrieved 22 September 2018. ^ a b "Hubble Team Breaks Cosmic Distance Record". hubblesite.org. 3 March 2016. Retrieved 28 May 2018. ^ a b c Drake, Nadia (3 March 2016). "Astronomers Spot Most Distant Galaxy—At Least For Now". Phenomena. Retrieved 28 May 2018. ^ Peebles, P. J; Ratra, Bharat; Aghanim, N; Arnaud, M; Ashdown, M; Aumont, J; Baccigalupi, C; Banday, A. J; Barreiro, R. B; Bartlett, J. G; Bartolo, N; Battaner, E; Battye, R; Benabed, K; Benoit, A; Benoit-Levy, A; Bernard, J. -P; Bersanelli, M; Bielewicz, P; Bock, J. J; Bonaldi, A; Bonavera, L; Bond, J. R; Borrill, J; Bouchet, F. R; Boulanger, F; Bucher, M; Burigana, C; Butler, R. C; et al. (2003). "The cosmological constant and dark energy". Reviews of Modern Physics. 75 (2): 559–606. arXiv:astro-ph/0207347. Bibcode:2003RvMP...75..559P. doi:10.1103/RevModPhys.75.559. ^ a b c Adams, Fred C; Laughlin, Gregory (1997). "A dying universe: The long-term fate and evolutionof astrophysical objects". Reviews of Modern Physics. 69 (2): 337–372. arXiv:astro-ph/9701131. Bibcode:1997RvMP...69..337A. doi:10.1103/RevModPhys.69.337. ^ Turner, M. S; Wilczek, F (1982). "Is our vacuum metastable?" (PDF). Nature. 298 (5875): 633–634. Bibcode:1982Natur.298..633T. doi:10.1038/298633a0. Retrieved 2015-10-31. ^ Coleman, Sidney; De Luccia, Frank (1980-06-15). "Gravitational effects on and of vacuum decay" (PDF). Physical Review D. 21 (12): 3305–3315. Bibcode:1980PhRvD..21.3305C. doi:10.1103/PhysRevD.21.3305. ^ Stone, M (1976). "Lifetime and decay of excited vacuum states". Physical Review D. 14 (12): 3568–3573. Bibcode:1976PhRvD..14.3568S. doi:10.1103/PhysRevD.14.3568. ^ Frampton, P. H (1976). "Vacuum Instability and Higgs Scalar Mass". Physical Review Letters. 37 (21): 1378–1380. Bibcode:1976PhRvL..37.1378F. doi:10.1103/PhysRevLett.37.1378. ^ Frampton, P. H (1977). "Consequences of Vacuum Instability in Quantum Field Theory". Physical Review D. 15 (10): 2922–28. Bibcode:1977PhRvD..15.2922F. doi:10.1103/PhysRevD.15.2922. Once Upon A Universe – Story of the Universe told in 13 chapters. Science communication site supported by STFC.